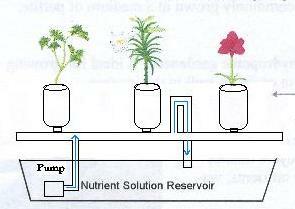 The nutrient solution is pumped from the reservoir up into the garden for a given period of time, the growing medium absorbs the nutrient solution, and then the nutrient solution is allowed to drain away. 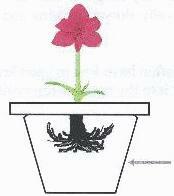 to nutrient reservior The nutrient solution is dripped onto the growing medium on a timed basis providing the plants with fresh water, nutrients and oxygen. Side view of grow channel in from nutrient reservoirÝÝÝÝ The plant roots develop in the grow channel. The top of the roots are exposed to air. 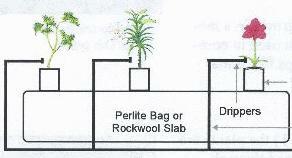 The bottom of the roots are exposed to the nutrient solution. Stagnant Nutrient Reservoir Although nearly maintenance free, most passive systems will have slower growth and development since there is no fresh oxygen brought into the root base.